Mason Macabre is more than just Harley Quinn’s neighbor in her new Coney Island digs—he just might be the man of her dreams. But to save his life, she’ll have to face the clown of her nightmares! With Harley and her gang of merry maidens battling to keep innocents out of the crossfire of her enemies’ latest vendetta, Mason’s been whisked away to the one place our hellacious heroine never wanted to set foot in again: Arkham Asylum. Inside its horrific halls, Mason’s at the tender mercies of none other than the Joker—and Harley and the Clown Prince of Crime have had the mother of all bad break-ups. Will she and the madman who helped make her what she is kiss and make up long enough for her new beau to escape with his life? 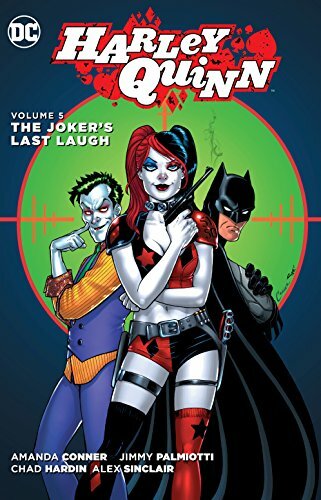 Or this time, will the joke be on Harley Quinn for good? It’s the reunion you’ve been waiting for! Courtesy of acclaimed creative team Amanda Conner and Jimmy Palmiotti, HARLEY QUINN VOL. 5: THE JOKER’S LAST LAUGH proves that when it comes to true love, Harley’s not joking around! Collects issue #22-25 of the ongoing series and the special issue, HARLEY QUINN: BE CAREFUL WHAT YOU WISH FOR.